The following is an e-mail that I received from Dr. Claudia Notzke, a renowned wild horse , enthusiast. Like myself she was mislead by the 16:9 Wild West episode that aired on Global television two weeks ago. I too was led to believe that the show would be a half hour program with hard hitting journalism, showing the continuing plight of our wild horses. I therefore spent three days with their crews, trying to show them the beauty which is our wild horses. Instead it was only a 10 minute spot glorifying the killings of the wild horses again and those that oppose them. I definitely concur with all of Dr. Notzke’s points. I had the dubious distinction (as I see it now) of being interviewed for Global TV’s recent program on Alberta’s wild horses. For a scientist and researcher involved in controversial issues dealing with the media is always risky but sometimes necessary and occasionally even desirable in the interest of sharing information and avoiding being stuck in the proverbial ivory tower. I must admit that this time I was left with a feeling of embarrassment of having been coopted for a production of dubious quality. My experience with interviews for the printed media had never been really negative, and as a result I agreed to an interview with Global TV when approached with what was presented to me as a thirty minute program on Alberta’s wild horses, investigating various perspectives on the issue. The 16:9 Bigger Picture on its website presents itself as hard-hitting, ground-breaking, in-depth investigative journalism. I thought such approach could only assist in clearing the muddy waters of the wild horse controversy, but I was wrong. The program presented wild horses as not much more than beautiful misfits in Alberta’s landscape, and it did so in anything but a “hard-hitting, ground-breaking”or “in-depth” fashion. As a matter of fact, various acquaintances of mine who do not know much about wild horses and do not feel strongly about this issue one way or another, commented to me that they found the program biased and uninformative. In my opinion even a 15minute program (with commercial breaks) could have been what it claimed to be. I was interviewed for two hours, and I am at a loss to understand why they wanted to talk to me about the “science” of the issue and then failed to air even a few sentences of a very concise scientific argument for wild horses as North American wildlife to counter-balance the (pseudo?-) science presented by the “other” side. Those readers of this blog interested in “the rest of the story” are referred to my Nature Alberta article below. And finally, one more thing, and here I am talking not as an academic, but as a human being and proud Canadian. There is much talk about science and even more talk about economics. I am going to go out on a limb and talk about ethics. Even the most jaded individual will have to admit that our great country -Canada- , the United States or any country in the Americas would not be what it is today without horses. We owe them! And what better way to repay this debt than recognize that some members of this species successfully regained their wild heritage and thus deserve acknowledgement as biological beings in their own right! So few of them are left. During the 20th century their numbers throughout Canada declined from between 10 000 and 20 000 to probably less than 2 000, due to bounty systems, unregulated capture and indiscriminate killing of the animals (a tripling or quadrupling of wild horse numbers in Alberta in a time span of 4 years -as suggested in Global TV’s program- is biologically impossible). These animals who coexist with other species, who have been shaped by natural selection for countless horse generations, deserve to be left alone without being harassed, brutalized or captured just to earn somebody a few bucks. I’d like to think that as a society, we can do better than that, even if our government is trying to convince us otherwise. It is up to us to prove it wrong. “The Horse War” (Cowley 2010) and “A Herd for the Killing” (Powter 2010) – these were the headings of articles in the recent popular press in Alberta. Such headlines bear eloquent testimony to the beleaguered state of western Canada’s wild horse populations. Only numbering in the hundreds (in contrast to their equally threatened cousins in the United States whose numbers amount to approximately 60,000 less than half of whom still roam free) their major population concentrations are found on British Columbia’s Chilcotin Plateau, in Alberta’s Rocky Mountain Foothills and Saskatchewan’s Bronson Forest. These animals have been subjected to mindless cruelty, with the body count of shot horses in central Alberta alone amounting to more than thirty over the past decade. In Alberta, it was only in January 2010, that the RCMP laid the first charges in any of the killings, and at this point in time, the outcome of impending court proceedings is entirely open. Up to the point where these first charges were laid, one was left to wonder about a “conspiracy of silence” and a disconcerting lack of determination and political will on the part of those investigating such incidents. As far as the government was concerned, there appeared to be overwhelming evidence to the effect that the death of wild horses was totally inconsequential for the authorities. Much of this indifference (and ambiguity) can be associated with the ongoing debate of just what these horses are. Many government agencies consider wild horses as domesticated escapees and invasive species with no dollar value attached to them as either livestock or huntable wildlife. As “alien” species they must be doing what all alien species do: compete with “native wildlife” and damage “native ecosystems.” This is powerful mythology and makes them a challenging cause to champion. The only scientific work ever conducted on wild horses in Alberta dates back to the 1970s and was carried out by R.E. Salter (Salter 1979; Salter and Hudson 1979&1980); it did not document forage or behavioural competition with either wildlife or domestic cattle. Independent and peer-reviewed research into the ecology and ethology of these animals is badly needed and provides great opportunities for up and coming biologists. The non-native, feral and exotic designation given by agencies are not merely reflections of their failure to understand modern science but also a reflection of their desire to preserve old ways of thinking to keep alive the conflict between a species (wild horses), with no economic value anymore (by law), and the economic value of commercial livestock. Native status for wild horses would place these animals, under law, within a new category for management considerations. As a form of wildlife, embedded with wildness, ancient behaviour patterns, and the morphology and biology of a sensitive prey species, they may finally be released from the “livestock-gone-loose” appellation. Using the 16th century as a baseline of what “natural” North American ecosystems should look like is totally arbitrary. Paleoecologist Paul Martin’s term “Columbian curtain” fittingly describes this blind spot. While there will never be absolute certainty about what led to the extinction of North America’s megafauna, there is overwhelming scientific evidence to the effect that horses did not disappear from this continent where they evolved over millions of years without the “help” of newly immigrated and very efficient stone age hunters. It is difficult if not impossible for most people to think in terms of “geological time”, but this ought to be “nature’s calendar” and the time frame in which to explore the legitimacy of the horse’s ecological status in our environment. This is not Australia or New Zealand, where the horse is indeed an “alien introduced species”, its well-deserved cultural and historical status notwithstanding, nor is it a “goats on the Galapagos” scenario! Government managers’ preoccupation with wild horses’ anticipated ecological damage tends to ignore ecological opportunities presented by horses. Where there is a greater number of species in a given ecosystem, having evolved and evolving a complementarity and a diversification of niches, there is also a healthier and more stable ecosystem, whose checks and balances are well established. The African savannah is the best example. From fossils we know that the grasses, forbs, shrubs, and trees of the Americas coevolved with a much greater variety of large herbivores than exist today. New World vegetation has evolved in the presence of herbivory by horses. Of all herbivores, horses tend to be the most effective “seeders.” Whereas cud-chewing cattle (and other ruminants such as buffalo, deer, antelope, and sheep) thoroughly masticate and destroy the majority of seeds they may ingest, the horse does not. Its inefficient post-gastric digestion system passes grass seeds, and by “banking seeds” insures the perpetuation of its own forage. Other benefits: horse trails being used by other species; crusted snow removal by horses to access forage and water, benefitting cattle, elk, deer and antelope; removal of coarse stands of grass, reducing fire hazard and providing spring grazing for other species; providing prey for predators. In several European countries semi-wild horses are used as ecosystem engineers, reoccupying their ancient ecological niches and in many cases boosting biodiversity. There are also potential cultural, genetic and economic (tourism!) opportunities. These observations should justify revisiting resource managers’ approach to the wild horse question. Currently no “management” is being implemented in Alberta, but capture (with no limits on numbers) is being facilitated with no concern for the impact on wild herds or the fate of the captured individuals. 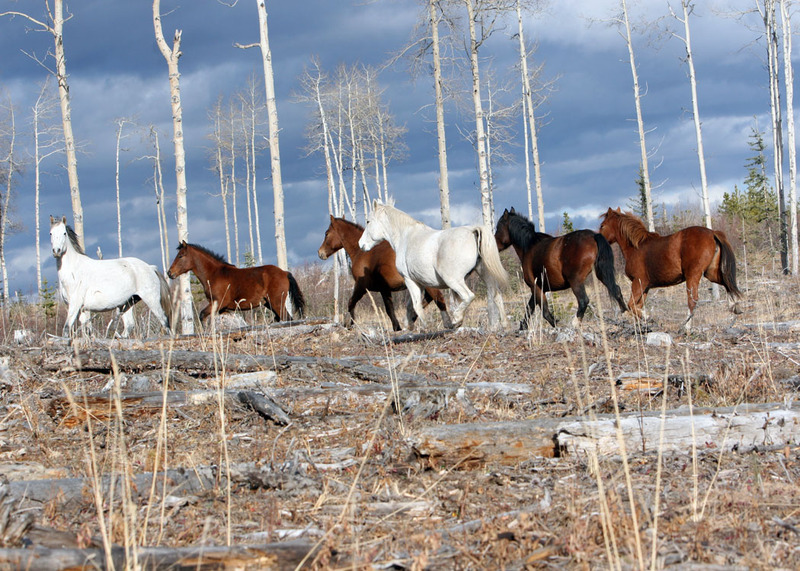 In 2004 the Wild Horses of Alberta Society prepared a well thought-out review of the Horse Capture Regulations, which deserves more attention than it has been getting. It proposes protection as well as management (where and when necessary) of wild horses on all public lands rather than just designated capture areas and placing wild horses under the jurisdiction of the Fish and Wildlife Division rather than the Public Lands and Forest Division of Sustainable Resource Development. It also puts great emphasis on the enforcement of regulations and stronger measures against individuals who illegally graze and release domestic horses on public lands. I would advise caution in following the United States 1971 Wild Free-Roaming Horse and Burro Act without a thorough study of its many loopholes, pitfalls and implementation problems. Furthermore, our management requirements are much less onerous, since wild horse numbers are smaller and more importantly, already subjected to the influence of a full range of large predators. In November 2009, there was a precedent-setting development in Saskatchewan: Bill No. 606 (a private member’s bill), An Act to protect the Wild Ponies of the Bronson Forest, was passed in the Saskatchewan Legislature. What is needed most of all is a change in attitude towards our free-roaming horses. Resource managers, conservationists and others who oppose the horse’s presence in the wild should try to open their mind to the possibility that the wild horse is not just a foreign domestic interloper or recent barnyard escapee. While herds in Alberta, Saskatchewan and British Columbia differ in their natural and cultural history, there is every indication that these animals are of varied origin, some in all likelihood descending from Spanish bloodlines, others of more recent domestic origin. What they share is natural smarts and genetic diversity acquired through generations of natural selection, features no longer present in many of our domestic breeds. Management decisions for wild horses should be made based on actual observations and research findings and verifiable data, not assumptions and prejudice. We owe it to the horse’s unique role in our own history and culture to acknowledge it as a biological being in its own right, not just as a servant of Man.